FOR CHRISTMAS DELIVERY, PLACE YOUR ORDER BY OCTOBER 15TH! The 'Clover Sunburst' Leather Wristband Bracelet by Soteria Leather is perfect for men and women. This custom wristband is made with recycled leather. 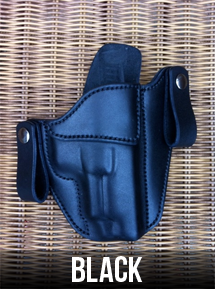 Be sure to read the comment below, from the holster maker. This custom leather bracelet made from the part of the hide that is too supple to make a good holster. The leather for this custom bracelet is from American cattle. This custom leather bracelet is made in the USA. The 'Clover Sunburst' custom wristband bracelet is 1 1/2" wide, and made with 'recycled' leather. Men: The standard sized wristband bracelet for a man is 9" long. Woman: The standard sized leather bracelet for a woman is 7-1/2" long. Sizing: The wristband bracelet is measured from one snap to the other. Sizes available: 5" - 11"
Your wristband bracelet will be shipped to you in approximately 2 weeks. As stated by the holster maker, These bracelets are made with the highest quality leather that I also use to make my holsters. 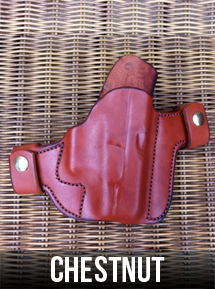 These are made from the part of the hide that is unusable for holsters, as it is the most supple and soft part of the cowhide, which is not appropriate for a holster; but, perfect to wear on your wrist! Instead of just throwing this leather away, I wanted to make something beautiful and wearable. Instead of wasting this amazing leather, people can now wear it for years to come. 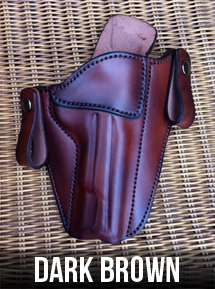 Click Here to see the beautiful Soteria Custom Holsters.